This recognition of a Purple Bead strung on a thong, is awarded to the staff member with whom you would most like to camp again. This award is now voted on by secret ballot of the junior staff members. Please e-mail if you can fill in any of the missing blanks! I was a little surprised when I read the history of the Purple Bead above. 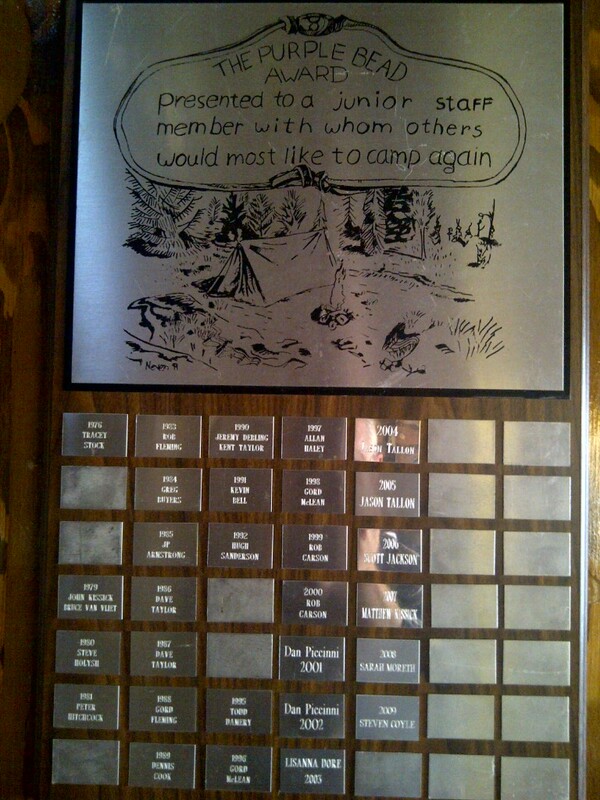 It was awarded to me in 1966 as a camper in a composite camp on Twister. A secret vote was held by all the campers on our second last day. We were told to vote for the camper we most would like to return to camp with and to make a thoughtful choice because this was the most important award of the camp. Three other awards – Red Beads – were awarded to outstanding campers as chosen by the scouters. As he presented it, I remember Skipper John Leroy saying that it was purple for the importance of the colour and because of all the coloured beads available for purchase, there were no purple ones. They painted a bead so no one could just buy one and claim they won it. (Not sure how complete that reasoning was.) The paint on the bead was wet when I got it and it has a texture to it from being handled while still wet. Looking at the beads on their thong just now, there are a red, two blue’s and a natural coloured one. The blue are for badges earned during the camp but I cannot remember what the natural one is for. It may have to do with swimming. I’ve also dug out the “Thunder Bird” that we were given at the end of the camp. It says: “Flash: Congratulations to Jim Stewart who won the purple bead.” I can scan that news letter to you. Just above that there is, I think, a fine example of the power of this camp. Skipper John wrote; ” You are not the only ones who have learned something new. For our ears were always open to opinion and I myself have learned something new” It happens I know exactly what he was referring to and to me it shows the breadth of learning at camp. I want to mention that Stig Anderson was TL at our camp which was, I think, the year after the canoe adventure he shared with someone else and which is written about elsewhere on this site. As campers, we heard little snippets of the story but didn’t get the whole extent and depth of their efforts. I’m happy to learn it now. I know every camper enjoyed the quiet fellow who had his own beloved canoe which he paddled so strongly and well. The letter also talks about how much rain there was on our overnight canoe trip but I don’t remember it. I remember the ice cream while waiting for our sleeping bags to dry at the laundry mat. So, now they are out, I think I’ll hang the beads in my office.